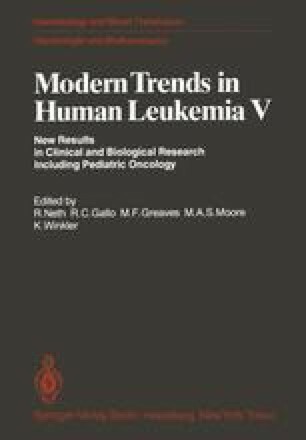 It has now been repeatedly demonstrated that it is possible to achieve complete remission (CR) in the majority of younger adults with acute myelogenous leukaemia (AML) [4, 5, 7, 11, 12], and that approximately one-fifth of patients in whom this is achieved will continue well without recurrence for many years [2, 6, 8, 10]. These observations have naturally stimulated considerable research in to how these achievements may be translated into cure being probable for the majority rather than possible for the minority. In general, the trend has been to increase the quantity of initial therapy to the limits of bone marrow tolerance, which has been considerably extended by the availability of platelet concentrates and powerful broad spectrum antibiotics. In 1978 such an approach was introduced at St. Bartholomew’s Hospital. In the light of there being no convincing evidence that maintenance therapy prolonged remission following very intensive initial treatment, and some (evidence) to the contrary [3, 9], it was decided to limit the duration of the programme to approximately 6 months by terminating all therapy after a maximum of six cycles of adriamycin (adria), cytosine arabinoside (araC) and 6-thioguanine (6-TG) given at approximately 3 weekly intervals.